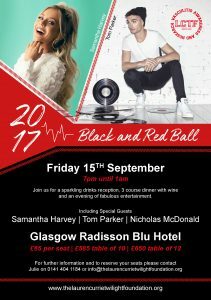 We cannot wait for our 2017 Ball! Come and join us for a fabulous night of Entertainment and help us raise funds. Join us for a sparkling Drinks Reception, 3 course Dinner with wine and we have fantastic prizes to be won! You can buy a table or individual seats, we promise you a great night! Call 0141 404 1184 and speak to Julie for further information and bookings.